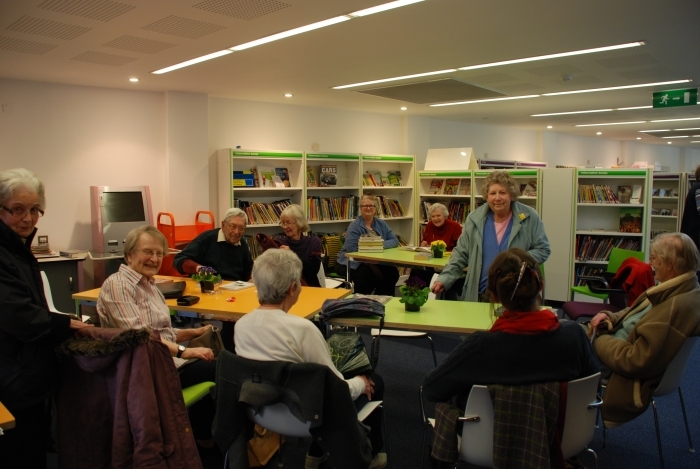 The GAP Library Club is held monthly in Alton’s public library on a Wednesday afternoon from 2pm — until 4pm. The library staff very kindly open up especially for us and the afternoon is an opportunity to leisurely browse for books, enjoy a cup of tea and biscuit, to share in conversation and listen to poetry and readings. Run by a variety of people but steered well by Peta Sutherland and our Anna Chaplain, Rachel Sturt, the following gives us a snapshot of what the afternoon means to those who come along. Library club for older people is somewhere friends can talk especially those, like me, who live alone. Otherwise I might as well talk to the walls! We are always given such a warm welcome. We all have a shared interest in books and can ask advice about books from the librarians. My eyes have been opened to different authors others have recommended. I probably wouldn’t come to the library at all if it weren’t for our club. My friend bullied me into coming! Two years ago Debbie invited me, as she thought it would be good for me, after my husband died. She was right and I have been coming ever since. Today was my first time. I was able to ask stupid questions but no one thought I was a fool. It’s great company and we ‘re not there long enough to fall out! Many of us can only attend because transport is laid on. 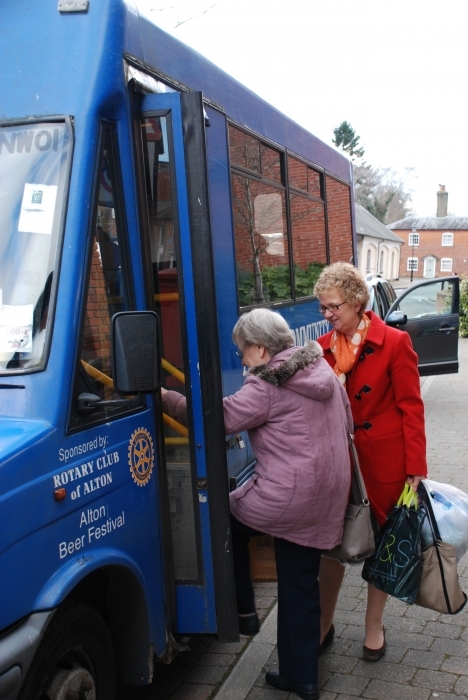 The adventure begins when the mini bus, kindly provided by the Community Centre, picks us up. We have a laugh. Using the seat belts is a challenge as they aren’t the most up to date! David Allen is our chauffeur and he often takes us on a scenic route with lovely views of the hills and fields round the town. The country side looks so beautiful in the sun. I enjoy the journey as much as the club as it is a chance to see a different part of Alton. We are very fortunate to be able to use the library when it is closed to the general public. We all have a laugh and can make a noise at Library club! All of us feel a bit spoilt. After we have changed our books we can ask the librarians and the volunteers for advice about what to chose next. There is a lovely section of big print books. They are happy to order books for us too and help us with the new self service machine. When we have enjoyed our tea and a choice of chocolate cake and biscuits we listen to members who bring along a poem to read out loud. It is lovely to be read to and to read to others who want to listen. Often we are given a copy of a poem to take away after we have read it out loud together. The library staff and volunteers enjoy the club too. We started on October 27th 2010 and asked people what they wanted. It was a help to people to find the books they were looking for. As we look back we all feel it has achieved what we set out to do. ‘ I am always pleased to be asked’ said one volunteer. Another loves chatting to the older people who come with a wealth of experience growing up in a different age, coming from different parts of the country, with different accents and customs. As we left one new comer said ‘ haven’t we all had a good time!’. A regular replied ‘ we always do’.